In a recent filing with the state DMV spotted by Macreports, the 66 cars being used by Apple are being controlled by 111 registered drivers. This is an increase in both vehicles and drivers since May 14, when Apple had 55 test vehicles and 83 authorized drivers. The increases suggest Apple is adding more vehicles to the fleet at a steady rate. The previous update on March 20 claimed there to be 45 Apple-owned self-driving cars, which would put Apple at introducing roughly ten more cars to the collection every two months. Despite the increases, Apple still does not operate the most autonomous test vehicles in the state. California's records indicate Apple's fleet to be the third-largest, behind the 117 cars and 333 drivers for GM Cruise, as well as the 72 cars and 411 drivers of Waymo. Tesla has 39 cars and 92 registered drivers in its own project. California has issued 56 autonomous vehicle testing permits, with 468 approved vehicles operated by 1,677 approved drivers. Notably, Apple has yet to apply for a driverless car permit from the DMV, suggesting it would prefer to continue with driver-assisted testing for the moment. 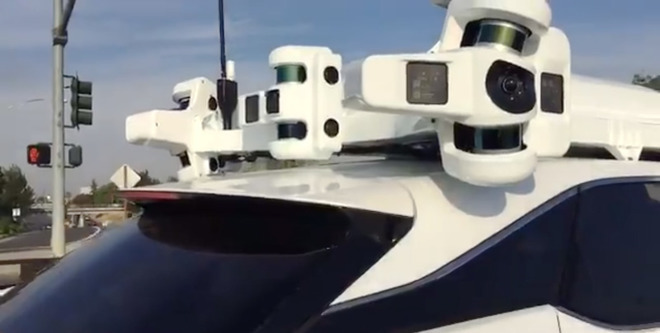 Worked on under the "Project Titan" name, Apple's autonomous vehicle technology was originally thought to be part of a branded car, but the focus reportedly changed to just the self-driving vehicle system in late 2016. It is unclear what the current goal for Apple's work is, but it is thought to be the autonomous platform itself rather than an entire vehicle, with the potential of partnering with an outside firm to create a ridehailing service. A connected self-driving project intending to shuttle company employees between facilities was reported in May to use Volkswagon T6 Transporter vans, after attempts to negotiate with BMW to work on the project allegedly failed. Running from Palo Alto to Infinite Loop, the PAIL program will include specialized dashboards, seats, and extensive modifications made to the vehicles, and will still be operated by a back-up driver and co-pilot, in case the self-driving element fails. Apple is also expanding the self-driving car team with senior Waymo engineer and NASA JPL engineer Jamie Waydo, who was responsible for checking the safety of prototype vehicles and coaching the autonomous competitor ahead of real-world road tests in Phoenix. Before Waymo, Waydo's time at NASA included working on one of the agency's Mars rovers. Project Titan has also been the subject of attempted trade secret theft, with one former Apple employee entering a plea of not guilty on July 16, after being accused of stealing a 25-page detailed schematic of a circuit board intended for use in an autonomous vehicle.